Is the Apple iPhone 5c the budget phone we thought it would be? The iPhone 5c is a curious one. Building up to the announcement - which also featured the flagship iPhone 5s - we were expecting a lower-priced handset with features similar to the iPhone 4S. What Cook and co served-up was a iPhone 5 in Technicolour with a price tag more premium than peanuts. With a starting SIM-free price of £496 for the 16GB model, it's expensive compared to the HTC One Mini (£365), Nokia Lumia 625 (£179) and Samsung Galaxy S4 Mini at £429, which we'd put in the same category. And, with the iPhone 5 primed to be snapped up at a cut price, is colour alone enough to make the iPhone 5c a best-seller for Apple? The c stands for colour and the iPhone 5c has plenty of that. At launch, the iPhone 5c will come in five hues; white, pink, yellow, blue and green. It'll certainly stand out from the crowd, especially with each being colour co-ordinated with the iOS 7 home screen. One of the complaints we had of the iPhone 5 was that it was a tad light. 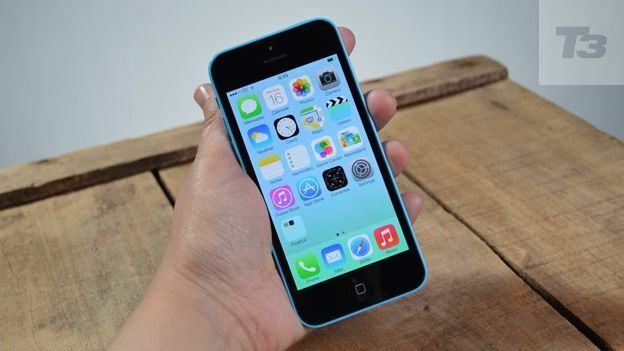 The iPhone 5c is heavier at 132g and also thicker at 8.97mm. This reassuring bulk and subsequent sturdy feel comes from a steel-reinforced frame, which also acts as an antenna, surrounded by a plastic case. However, like Nokia's Lumia range, this isn't cheap plastic, it's a one-piece polycarbonate chassis that's warm and pleasant to the touch. Some might even say nicer in the palm of your hand than cold, hard metal. The high-gloss finish means the iPhone 5c looks and feels like a premium product and one that could cope with more bumps and scrapes than their glass-back predecessors. Apart from the colour, the iPhone 5c build is almost an exact carbon copy of the iPhone 5. The exterior buttons remain the same, the headphone jack resides on the bottom edge, along with the speaker and Lightning port, while the volume rocker lives on the side next to the ring/lock switch. Powering the iPhone 5c is the A6 chip found in the iPhone 5. It's still noticeably faster than the iPhone 4's A5 processor and, with the iOS 7 update, the difference is even more obvious. The 5c multitasks with ease and whizzes through the UI. Watching HD videos and playing graphic-intensive games also impress. Connectivity wise, the 5c sports speedy N Wifi and Bluetooth 4.0 but NFC remains on the blacklist of Apple features. Those hoping for a bigger screen will be disappointed; Apple has stuck with the 4-inch variety. Contrary to rumours, it's still a Retina display with a resolution of 1136x640 pixels at 326ppi. It might be smaller than its main rivals - the Samsung Galaxy S4 Mini and the HTC One Mini - but what it lacks in size, it makes up in resolution. The result is a pin-sharp OS and bright and colourful web pages, videos and games. Letter-boxing has all but disappeared from mainstream apps and while making the switch from bigger-screened handsets to the 5c will be apparent, those upgrading from an iPhone 4 or 4S will notice an instant improvement. The rear iSight camera on the iPhone 5c is a carbon copy of that found on the iPhone 5, though iOS 7 brings with it a new camera app that offers instant filters and Instagram-like square shooting. The 8MP sensor isn't industry leading but it takes decent shots. As aforementioned, the camera app has a new UI that allows you to scroll through photo, video, square and panorama capture. There are also eight new filter options to choose from. In portrait, it works perfectly, yet, in landscape the shooting menus remain portrait and we found our digits accidentally altering options when we meant to press the on-screen shot button. Videos are captured at 1080p at 30fps and there's now the option of 3 x zoom as well as the ability to take still shots while recording. The front-facing snapper is a FaceTime HD camera that offers 1.2-megapixel shots and 720p video recording. The specs are equivalent to the iPhone 5, but the quality of the pics and videos seem to have improved, as has image processing, which is much faster. The photos app has also experienced a significant upgrade. Photos are now organised into moments, collections and years, meaning you can group your pictures based on where you took them and the time they were taken. It's a neat app but we wish we could access them straight from the camera. To get to your photos, you must come out of the camera app and into the gallery. It's a small niggle but one that could get tiresome. The iPhone 5c was made for iOS 7. The colourful OS looks fantastic on screen and complements the colourful chassis. Side-by-side, an iPhone 5 running iOS 6 looks extremely dated and bland. However, apart from aesthetics, it's hard to see the significant differences between the iPhone 5c and an iPhone 5 running iOS 7. Control Centre, Notifications Centre, multitasking, Air Drop, improved Safari and Siri will all land on older phones. With the iPhone 5 sporting the same chipset, we can imagine a very similar experience. Compared to an iPhone 4S, the 5c, with its upped processor, bigger screen and slick-running iOS 7, is a clear winner. For more on iOS 7 head to our full iOS 7 review. The iPhone 5c is speedy. The A6 processor keeps the phone ticking along and iOS 7 feels fluid. The speaker remains placed at the bottom of the phone and even though there's only one grille, music plays louder and sounds are richer. With dual mics adoring the top and bottom of the phone, FaceTime and Skype calls were crystal clear too. The iPhone 5 offered LTE and now the iPhone 5c offers an expanded list of LTE bands. With 4G saturating the UK, this is a welcome addition. During our testing on the EE network, coverage was excellent, browsing the web and watching YouTube videos were comparable to Wi-Fi speeds but we did notice some slowdown when it came to downloading content from the App Store. Against the iPhone 5, the 5c's battery life is an improvement. Quoted stats are 10 hours 3G talk time, and 250 hours standby compared to eight hours and 225 hours, respectively. In real-world testing, the iPhone 5c proved longer lasting than the iPhone 5. On and off, a day's-worth of internet browsing, video playing and general fiddling left us with around 40 per cent charge. We never expected Apple to build a cheap anything and the 5c is testament to that. Launching a phone to appeal to a wider demographic is a brave move, especially when you're considered a premium brand. With the simultaneous arrival of the iPhone 5s and a feature-set that matches the now-defunct and older iPhone 5, we'd put the iPhone 5c in the mid-range phone category. As a mid-range phone, it's comparable to the HTC One Mini and the Samsung Galaxy S4 Mini. The glaring difference, however, is that it's not comparably priced. On a 4G contract with 1GB of data, unlimited texts and calls the price comes to around £1,000 (24-months, £37-a month, £99.99 for the handset). It's not cheap, especially when you can pick up the excellent S4 Mini on the same contract for a total of £768 (24-months, £32, free handset) or the impressive HTC One Mini at £888 (24-months, £37-a month, free handset). All being said, the iPhone 5c is a great device and, if contract prices drop a little, could be Apple's best-selling phone ever. The colourful exterior is a winner and iOS 7 is a fantastic update. We think it looks better on the 5c than the 5s. However, convincing the world that it's worth the substantial outlay, especially when compared to other makers' deals, could be a hard sell. iPhone 6 vs iPhone 6S: what’s changed, and should you care?